Tile has grown exponentially in popularity in the last few years. It looks beautiful, is durable, and also practical for both homes and businesses in the Saddlebrooke area – and nationwide! However, many people fail to realize the amount of care tile and grout need for you to enjoy the sophisticated flooring year after year. This is where professional tile and grout cleaners come into play! Hiring a pro can save you money in the long run, and keep your floors looking like new a whole lot longer. Here are our top four reasons to let the pros handle your floor care needs. Let’s face it, the stuff you pick up on the Home Depot shelf probably is not going to have the same strength and impact as a professional-grade cleaning product. Plus, many say all you need to do is spray it on, let it sit, then wipe or rinse away. If a cleaning claim sounds too good to be true, that might just be the case. If the product does need to be washed or scrubbed away, you could be on your hands and knees for hours trying to finish the job. 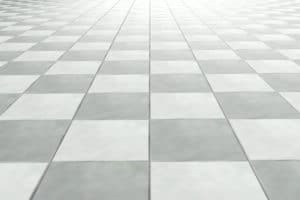 Professional cleaning companies, like Commercial Cleaning & Restoration, have years of experience doing tile and grout cleaning and use equally effective and reliable cleaning products to get the job done. These products, combined with professional tile and grout cleaning equipment, can reach deep into the pores of the grout and some tile, and release set-in debris. Here is the honest truth: if you’re using a mop on your floors, you’re only compounding the dirt and debris problem. Mopping your bathroom floor means just pushing the dirt around and not really offering a true clean. Over time, despite your routine cleaning efforts, surfaces may begin to dull and stain because the dirt remains. A professional cleaning company has equipment that is a good balance between effective and abrasive, so surfaces aren’t damaged. They also bring an array of experience with various types of surfaces so your floors will be left shining like new, not dull and damaged from using the wrong chemicals. Has some older tile in your building seen better days? There is a good chance you don’t need to replace it; it just needs a thorough cleaning. Remember the cleaning techniques and products we talked about above? Each of those is specially designed to get rid of stains and discolorations, as well as dust, dirm and grime! If you’re like most of us, you don’t have time to spend hours scrubbing your tile floors regularly. What would take you hours to complete can be done by a professional cleaning company in 60 to 90 minutes, depending on the size of the area or areas needing to be cleaned. And once the cleaning is done and your grout is resealed, you can rest easy knowing your flooring investment is protected.